Dean and Adam Skelos were found guilty during their July retrial of eight counts of conspiracy, extortion and bribery. Former State Senate Majority Leader Dean Skelos, convicted on federal corruption charges for shaking down businesses to obtain $300,000 in jobs and fees for his son, Adam, will report to prison Jan. 8 rather than seek bail pending his appeal, his lawyer said Tuesday. 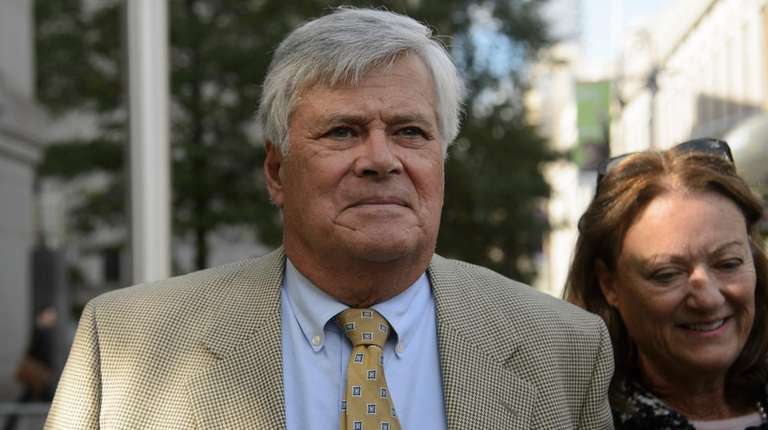 Dean Skelos, 70, a Rockville Centre Republican, was sentenced last month to 4 years and 3 months in prison and had until Nov. 9 to provide notice to the court if he was requesting to remain out of prison during his appeal. But Alexandra Shapiro, Dean Skelos' Manhattan attorney, said the former GOP lawmaker is prepared to report to prison early next year. “Mr. Skelos chose not to pursue bail at this time, but that is no reflection on the merits of his appeal, which we remain confident about," Shapiro said. Dean Skelos will serve his time at the Otisville Correctional Facility, a medium-security federal prison in Orange County. Adam Skelos, 36, also of Rockville Centre, was sentenced to 4 years in prison and will not appeal his conviction, records show. He also will begin serving his sentence Jan. 8, at a low-security federal prison in Danbury, Connecticut. John Kenney, Adam Skelos' attorney, did not respond to a request for comment. Dean Skelos, a fixture in the State Legislature for three decades, was once the most influential power broker on Long Island. In 2011, he became Senate majority leader, serving as one of the so-called "three men in a room" — along with the governor and Assembly speaker — on key legislative and budget issues. But Skelos' career came to a screeching halt when he was charged in May 2015 of using his political power and influence to win government contracts and a no-show job for his son. Dean Skelos was accused of shaking down a real estate company, a malpractice insurer and a Nassau County contractor for more than $300,000 in jobs and contracts for Adam Skelos. Both father and son were convicted in December 2015, and Dean Skelos was expelled from the Senate. Dean Skelos was sentenced to 5 years in prison, while Adam Skelos was sentenced to 6 1/2 years in prison. Neither man served any time while their appeals were pending. In September 2017, an appeals court vacated the conviction. The court argued that the district court judge's instructions to jurors did not comply with a later U.S. Supreme Court decision that narrowed the acts required to convict public officials in a quid-pro-quo bribery scheme to formal exercises of government power, not just meetings or telephone calls. Prosecutors retried the Skeloses, with the nearly monthlong 2018 trial closely mirrored the 2015 trial, with the notable exception that Dean Skelos took the stand in his defense this time. The outcome was the same and both men were convicted of all counts.